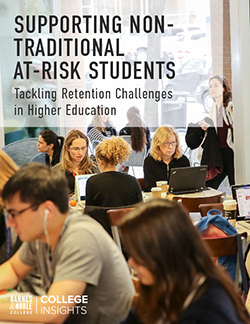 As enrollment numbers continue to decline and student demographics rapidly change, colleges and universities are faced with an even greater need for strategic recruitment and retention practices. Non-traditional students are becoming a key population for schools, representing one of the fastest-growing segments within higher education —and redefining the face of today’s college student. In fact, according to the CLASP Center for Postsecondary and Economic Success, enrollment of non-traditional students is projected to increase more than twice as fast as traditional students from 2012 to 2022. Non-traditional status refers to the presence of one or more non-traditional characteristics, including delayed enrollment, part-time attendance, veteran status, working full time while enrolled, having children, being a single parent, or being a recipient of a GED or high school completion certificate. These students face a unique set of challenges and have specific needs that must be met in order to feel supported and successful in their academic journey. So, how can colleges and universities improve their non-traditional student retention rates and degree attainment? Reaching out and engaging them with existing services and finding new ways to address unmet needs may help schools positively impact retention rates — and encourage a wider range of students to participate on campus, building a more robust, inclusive culture. Barnes & Noble College Insights™ uncovered six key ways that schools can help non-traditional students address challenges, increase retention rates and bolster long-term student success. Understanding who is most likely to need support allows schools to focus efforts on helping non-traditional students succeed. By utilizing new learning solutions that include analytics and measure performance, institutions can identify struggling students, intervene early and improve learning outcomes. Offer financial guidance and assistance. Financial concerns are the number one reason that non-traditional students give for quitting a program. And, financial assistance is their top request for additional support from their schools. Offering non-traditional students financial guidance as well as assistance can mean the difference between them staying enrolled and graduating — or dropping out. Increase access to affordable materials/learning solutions. Proactively offering students options for more affordable course materials and, new learning methods and tools such as inclusive access models and courseware, will help non-traditional students be prepared for class. Offer services that will help them deal with their stress. Educating students on campus resources that might not be as intuitive for them — such as skill-building assistance or mental health services — can make a big difference. Act as their support system and help them engage more deeply. With numerous responsibilities pulling them away from campus, it’s not surprising that non-traditional students feel less connected to their school and peers, compared to traditional students. Planning unique events and activities tailored to non-traditional students can help them build connections to their school, faculty and with peers. The more schools can keep faculty, advisors and students connected, the better equipped students will be for success. Provide clear, proactive communication and information about the support services offered. Making an extra effort to reach this time-challenged population increases the chances that they will understand and make use of the resources available to them to help them succeed. Non-traditional students — and particularly those who are at risk — have unique needs, strengths and challenges. This student demographic will continue to grow as the new economy demands a more educated workforce. Investing time and resources to better understand, engage and support these students is critical for colleges and universities who are looking to improve their retention and graduation rates. Non-Traditional Students: Are They at Risk?